Is your office a place of soul-destroying negativity? 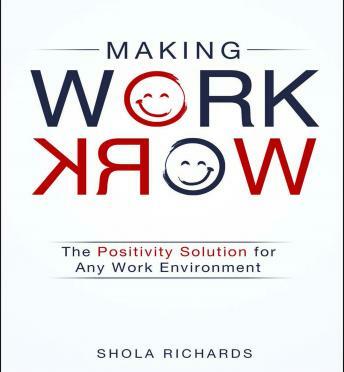 Shola Richards-keynote speaker, award winner, and creator of The Positivity Solution blog-is about to change that . . . forever. We need to treat each other better. Period." Shola Richards had reached the end of the road: after nearly two years at a soul-sucking job, he felt numb and suicidal. So he quit and devoted himself to nothing less than transforming the workplace, turning it into a space of respect, courtesy, and endless energy. Making Work Work focuses on inspiring current and future leaders to start a movement that will banish on-the-job bullying, put meaning back into work, and enhance coworkers' happiness and engagement. Richards, whose popular blog has a worldwide following, explains why inaction is insane, why we must move forward with positivity, and why the "abc" employees (asshats, bullies, and complainers) are so destructive. This motivational guide will stay in listeners' hearts and minds long after they finish listening to it.